Information on the Western Electric Panel telephone switching systems. The "Bell System" (Western Electric) never liked the idea of allowing customers to dial their own calls since they specialized in "customer service" and had operators complete all calls. By the late 1910's, they started to realize that this may not be a good idea and started to use step by step systems (as described on the Step by Step page). The first Panel switch was installed in the early 1920's in Omaha, Nebraska and others were installed throughout the 20's and 30's in most metropolitan areas in the USA (except for Los Angeles, which was step by step to be compatible with surrounding independent telephone companies). Step by Step switches could work well in small communities, but the Bell System found that it would not work well for large metropolitan areas where there were a large number of calls in progress at an one time. The reason was that the step-by-step switch had limitations due to its direct control design and small amount of connecting circuits that could connect to other subscribers in the same switch or to another switch.. The Panel switch was the first telephone switch to use a concept of �store and forward� by use of a device called a �sender� which can store a number and then act upon the dialed number to route the call the best way possible. Line Finder Frame - The line finder frame provides means for associating a subscriber�s line with the switching equipment and establishing connections. District Frame - The district frame provides outgoing routes for the originating call. At this frame are circuits to other switches, to operator switchbaords, or to other frames. Office Frame - Office frames provide additional outgoing circuit capacity when the requirements exceed the capacity of the district frame. Incoming Frame - The incoming frame is the terminating point for incoming circuits to make connection between and provides a path to the final frames. Final Frame - The final frame is the last step in the connection of a call to the destination subsbriber. 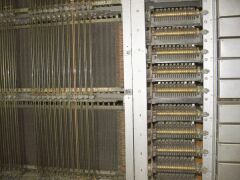 Panel systems had a unique system of "revertive pulsing" when a call was connected to or from a Panel switch (or a switch which supported revertice pulsing) by the receiving switch pulsing BACK to the originating switch! Instead of sending dial pulses out TO the terminating switch (as in Step by Step), it received them FROM the terminating switch. Most Panel offices were removed from service by the late 1970's, though there is a rumor that the last Panel office in service was located in northern New Jersey and was removed in the early 1980's. Very detailed information on how calls are handled in a Panel switching system.